Born in 1948, David C. Pack grew up in the American Midwest, in Lima, Ohio. Focused largely on sports and competitive swimming for 14 years, and having achieved high school all-American honors, as well as having begun training for the 1968 Olympics, Mr. Pack experienced a major turning point that became a course-altering—and life-altering—event. He began to listen to The World Tomorrow radio program, sponsored by the Radio Church of God, and heard Herbert W. Armstrong announce the true gospel of the Bible—the good news of the coming kingdom of God. He learned there are only two ways of life, that of “give,” experienced by very few, and the way of “get,” the choice of most—and that God’s kingdom represents the only path to universal peace, happiness, security, prosperity and abundance, longed for by all in every age. After intensive study, Mr. Pack became a member of the Church (later called the Worldwide Church of God). Declining acceptance to Dartmouth College, as well as an appointment to the U.S. Naval Academy, and numerous scholarship offers, Mr. Pack chose Ambassador College at Pasadena, California, world headquarters of the Church. Upon graduation in 1971, he married Shirley Ochs (who died in 2007), a fellow Ambassador College graduate and former personal secretary to Mr. Armstrong, and entered the ministry. He served congregations in Indiana, Illinois, Wisconsin, New York, New Jersey and Ohio, and trained and supervised other ministers in a wider region. Having begun as a writer in the late 1970s, Mr. Pack has authored over 80 books and booklets, and a vast array of articles. He has traveled the world, pastored thousands, established countless congregations and conducted many public Bible lectures. Mr. Pack has also held a number of leadership positions that have given him a wide range of ministerial and administrative experience. Upon Mr. Armstrong’s death in January 1986, the true gospel message and virtually every teaching that flows from this most central truth was rejected by his successors. Standing on conviction, Mr. 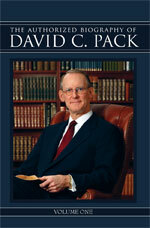 Pack left the Worldwide Church of God in 1993, educating and leading the way for thousands who would follow. In 1995, Mr. Pack inherited his parents’ successful natural food business in North Carolina, and gained invaluable additional experience in business planning and construction, as well as elements of marketing, advertising, corporate finance and business expansion. Selling the business in 2000 to devote full attention to a rapidly growing worldwide ministry and Church, he had been prepared for the future role as President and Pastor General of The Restored Church of God (RCG). Determined not to compromise his beliefs, Mr. Pack started RCG in May 1999. The Restored Church of God is a truly unique organization, unlike anything else on Earth. Under his leadership, it proclaims a powerful and positive message, answering the greatest question on the minds of billions: What is the purpose of human existence? This requires special focus on the scriptural solutions to the awful problems, troubles, evils and ills mankind has always faced, but which have grown much worse in the 21st century. Mr. Pack had come to understand that the governments, institutions, educational systems—and religions—of men invariably treat the effects instead of the causes of the woes afflicting every nation. And that these effects will only be removed within the framework of God’s Supreme Master Plan—a purpose involving every human being. Tragically, almost none understand this very greatest of truths. 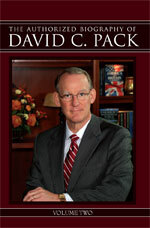 Published on the largest biblically based websites in the world, Mr. Pack’s and the Church’s materials address the everyday concerns of the average man and woman—and do so without soliciting funds, proselytizing or involvement in politics. All literature and programs are offered free of charge and in the public interest. Mr. Pack is dedicated to teaching the only path to world peace—the good news beyond today’s bad news. In this regard, he has produced or guided into production a vast reservoir of educational material for people of every age. The Church’s flagship magazine The Real Truth, of which Mr. Pack is Publisher and Editor-in-Chief, and his The World to Come program have an audience of millions and reach every nation and territory of the world, including heads of state and other leaders in government, religion, education, industry and media.